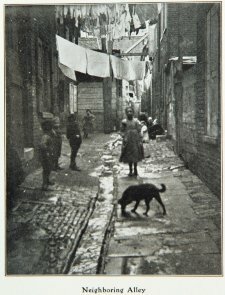 Caption: "Neighboring Alley." Children in alley. Dog in foreground. Clotheslines hanging across alley. "Starr Centre Association Annual Report, 1905," Philadelphia: Starr Centre Association. p. 22.